It is said that history is told by the victors and if you read enough history books you know that to be true. The stories are not always one sided, but can paint a rosier picture than what really happened. What you end up seeing all depends on the artist, where some might be a little light on what happened, others can go all in and show a much harsher reality. The good thing is both sides can be told and which one all depends on the storyteller, though sometimes those stories come off more like an apology and lose a lot of what they were meant to say. It’s hard to tell what story you will be hearing, but you can get a good idea who wrote the story. For The Best of Enemies , a story about school integration, the writer finds a way to make it toothless. We follow Ann Atwater ( Taraji P. Henson), a woman who just wants black people to be treated fairly, which seeing that she is in the south in 1971, that is not a shared opinion by everyone. One such person who does not want that is C.P. 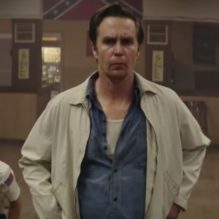 Ellis (Sam Rockwell) the president of the clan, both his and Atwater’s life are about to be thrown together in a way that neither of them want or expected. When the black school burns down, the town of Durham is faced with a choice that they cannot do business as usual. With Durham unable to agree on a decision, a judge orders a coming together where a mediator named Bill Riddick (Bobou Ceesay) would have the town vote on the changes that are being proposed. What starts off as a no-way-in-hell situation soon takes a turn for the better that leads to an outcome that no one would have seen coming. Where The Best of Enemies excels is in the performances of the two leads in Rockwell and Henson, who, let’s face it instantly make anything better they are in. That though is about the only place where this film makes an impact. For a story about such an important change for the city of Durham and eventually the country, it is told in a way that feels safe and really has no bite to it at all. Written by Robin Bissell, who also directs feels watered down as it moves at a snail’s pace making its two hour run time seem much longer. It doesn’t help that the film feels lifeless and coming from a trailer with so much energy, the actual product feels like a letdown. That feeling carries over to even the most climatic point in the movie which itself is pandering for applause from its audience, instead of actually giving meaning to what was so important at the time. The Best of Enemies really comes off as the safe version of this story, one that never takes chances and always lets you see its cards. This event in history deserved a more honest telling, but at least it’s better than not being told at all, though not by much.